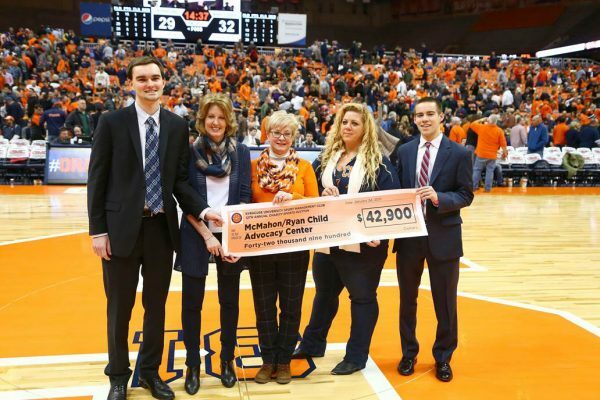 The Sport Management (SPM) Club in Falk College has announced that it raised $42,900 for the McMahon/Ryan Child Advocacy Center as a result of its 12th Annual Charity Sports Auction. During the SU men’s basketball game on Dec. 10, supporters placed bids on hundreds of items, including sports memorabilia, electronics and tickets to major sporting events. In conjunction with the live event, Steiner Sports also hosted an online auction, which showcased a number of premium items up for bid. Representative of the SPM Club present a check for $42,900 to the McMahon/Ryan Child Advocacy Center. From left to right: Alex Wood, 2016 auction co-chair; Kate Veley, Sport Management Club advisor; Linda Cleary, McMahon/Ryan Child Advocacy Center executive director; Colleen Merced, McMahon/Ryan Child Advocacy Center associate director; and Kyle O’Connor, 2016 auction co-chair. McMahon/Ryan is a 501(c)(3) nonprofit organization dedicated to ending child abuse through intervention and education. The organization offers a safe, child-friendly process for abused children and their families, supported by a committed, professional team specializing in the investigation, prosecution and treatment of child abuse. The Child Advocacy Center provides services to nearly 700 child victims and their families each year. For more information on this annual event or to learn how you can help, please visit www.sucharitysportsauction.com .